If I was to start a travel blog again, there are so many things I would do differently. Hours of work wasted, yet many more put to good use. I’m here to share my travel blogging experience from the past three years and give you a step-by-step guide on how to get blog followers. This will include how to gain more followers on social media, how to increase blog traffic and the processes and plugins that I use to save time while gaining more followers. When you first start a job, what do you do? You find ‘friends’ -­ like-minded colleagues whom you learn from. Blogging is no different, networking is key. For example, in the beginning, a mistake I made was writing friendly posts for family members. It wasn’t until I spoke to other bloggers that I realised I had to break out of this routine. To be successful, you have to treat your blog like a business from the beginning. Aim to network with bloggers at all stages – those who are just starting out, the more experienced, and the kings/queens of the blogging world. You can build relationships on any social media platform, but most notably Twitter, Facebook and Instagram. My best advice for Twitter is to join Twitter Chats. These weekly travel chats are run by hosts who pose several questions with a related hashtag for interested Tweeters to reply to. I’d suggest using Tweetdeck to help manage the chats. Comment on other people’s / blogger’s tweets and follow them if you so wish. Many will follow back. This is one strategy I used to meet other bloggers while increasing my Twitter following. Read more: Get more followers on Twitter for free (and fast!) by using these easy tips to how I reached 10K followers on Twitter – Twitter for Bloggers. For Facebook, ask to join Facebook groups. These pages are a community of bloggers where members can either ask for advice or join social media shares. Being asked to admin Facebook groups – I’m now on the other side! I really believe that the growth of Two Scots Abroad is down to my contribution to these groups. Think outside of your niche too; is there a blogging group for your nearest city or country? For travel bloggers, can you answer questions on local tourist boards or national flight company Facebook pages? Etc. While participating in Twitter Chats and Facebook groups, be professional. Don’t be afraid to offer support to other bloggers who seek help. Offer your advice, not your agenda! Be aware, keyboard warriors exist within these blogging communities too. There are non – blogging Facebook groups which are also great – just be wary that you can be thrown out if you self promote without being asked. They often provide opportunities for you to share your blog posts, though – a nifty trick to get more blog followers and network with followers of your niche! Networking can certainly help with increasing your blog and social media following but must be done in tandem with other techniques such as social media sharing. Initially, I was only sharing my own blog stuff on social media. I felt like I was shouting out into the abyss and nobody was listening to me. The solution? Sharing other blogger’s work. How? By joining social sharing groups. Again, on Facebook, there are groups where bloggers can post a link to a social share such as Pinterest and then comment/like / share (each group differs) on the specified amount of other posts in the thread (for example, the ten links above your post). Conduct is also vital here: don’t post unless you can reciprocate on the specified number of posts. Otherwise, you’ll risk irritating the voluntary admins, other bloggers will think you are freeloading, and you could get thrown out of the group altogether. Always remember that admins of these groups are volunteering their time. Avoid backchat if you are called out for not reciprocating. If you want your content shared and the support of the group, you need to do your bit too. *Make sure that your travel blog website is visible on your Facebook page. If you’re not a travel blogger, there are plenty of alternative for other niches. Just search on Facebook for your niche. So what do I do with all of these social shares?! There are social media scheduling sites which help you plan ahead and save time. I use Buffer (the free version which limits activity) and Hootsuite (no limit) to help manage Twitter shares. Other bloggers pay for CoSchedule, Tailwind, or use Buffer Pro. Be wary of mass sharing to all platforms, each platform requires a different tone. I loosely use the site IFTTT which lets you set up ‘recipes’ which connect one platform to another – so when a blog post goes live, it automatically appears on Twitter etc. I’m not keen on using mass sharing for Facebook but I do use the ‘Facebook schedule’ for posts. You won’t see much success in increasing traffic to your blog by ‘dumping’ information on social media, in fact, you might even be ‘filtered’ by Twitter for not interacting enough (see Twitter post for my horrible experience of this). To recap: use these social media scheduling tools to help plan and manage your shares (and time) but don’t forget to engage with your audience. I quickly realised that there is very little point in publishing poor quality photos on any social media platform, especially Instagram. I saw a significant increase in Instagram engagement when I began editing photos (using Lightroom) and only sharing my best images. I plan my grid on Planoly. The app lets me upload images and move them around until I get the perfect composition. If I have an image that is ‘off’ my normal tone (or the majority tone of the images I’ve been posting) I post in threes. For example, if I have a sunset image, I try to organise my grid so there are three sunset pictures side by side with the past showing a hint of the future image colour. The key to IG is like, comment, comment, comment, like, like, and hashtag strategically! Get the picture? Instagram is hard work! See above and below for more details on my Instagram strategy. The same goes for Pinterest. Post vertical pins. Use Canva or Adobe Spark for creating pins. They are both free and accessed online. Yes, quality over quantity for images is important, but posting frequently on all social media platforms is too. For Pinterest, I pin new pins to group boards (see Pinterest post for more on these!) and take part in a Pinterest share whenever I post a new article. I used to post twice on Facebook but have now reduced to once a day at 19:07 UTC. I reply to any comments in the evening. Engagement is best when Craig and I are both in the picture, pictures do better than links, questions and poll type statements are golden but videos are king. For Twitter, I used to schedule other people’s tweets every two hours (from a Twitter share). I also used to use a plugin which shared old posts from my site every two hours but removed this as I thought it may be the cause of me being ‘filtered’. I scheduled tweets advertising new posts for four days after they are live. In addition to this, I log in for daily conversation with followers, and weekly Twitter chats. I stopped using the plugin which shares old posts as I saw that my engagement score was low. I now engage more directly. After I have posted the image, I post a heart/image in my group pod and members respond with likes and comments. I am no longer in an IG pod/group. The level of work was not worth the effort. I then target specific hashtags I am trying to push and engage with Instagrammers who have used these hashtags. For example, when I was in Slovenia, I used the hashtag #ifeelsLOVEnia and engaged with this community. Alternatively, I engage with IGers who have recently liked bigger travel accounts than mine. I do not target travel bloggers and I avoid accounts with a large following (like 5K+). I aim for accounts where the IGer follows more accounts than has followers. 2017 Shadowbanning – Like Twitter’s spam jail, IG has now started shadowbanning certain posts. There are a number of reasons floating around such as the use of comment pods (although some of my pod are not banned), the use of specific hashtags that IG has banned, hashtags in the comments field and not the caption (one of my IG friends says that he is not banned for the hashtags in his caption but is for those in the comments). So what does Instagram shadowbanning mean? Your image will not show up under your hashtags; no top 9 and not in the recent posts section so this totally trumps any chance you have of reaching a new audience and tanks your engagement. I am so tired of IG! Another reason why you should not rely on one platform for marketing. Some believe that the shadowban never existed! The algorithm just changed and we were all hit. IG wants you to use the platform naturally, and buy ad space from them, obviously. I love Insta Stories! So easy to use and once you hit 10K followers you have access to swipe up where you can position article links! Quick note – follow/unfollow strategy is an active strategy. This is one of many tricks used by bloggers to get more followers, and that is cool with me. Please don’t waste your energy being upset that other bloggers have unfollowed you, concentrate on lovers of your niche, not the bloggers! Moving away from social media, I am now going to talk you through some website tips which not only get more traffic to your blog (for free!) but also prevent any future meltdowns! I have had two website tragedies in the past year, but like a girl scout, I was prepared. I use WordPress which I am happy with, but do keep in mind that WordPress updates and this can sometimes cause havoc to your website. Plugins that once worked may not be compatible, other plugins may crash your site. This is when you will praise the online gods that you backed up. Ask your service provider how to backup or add a backup plugin, such as UpDraft. Back up your images! I use iDrive which backs up automatically or you can set it up manually (I ran it overnight initially). Time to celebrate – I managed to get out of the 7K monthly unique views rut! How? Focussing on SEO centric posts (aka posts that rank well on Google). I’ve now reached 11.5K 30K 80K monthly unique views and 67K 100K page views (seriously crazy jump) and it’s all down to the following changes. You should scatter your ‘longtail keywords’ (longer phrases which are more specific) throughout your post. I did initially tell you that I’d be investing in Longtail Pro, however, the changes in Google Keywords Planner (now showing large numbers as opposed to specific) has made it redundant so I purchased KeySearch instead. KeySearch helps you find the best keywords to use for each post, I am loving it! 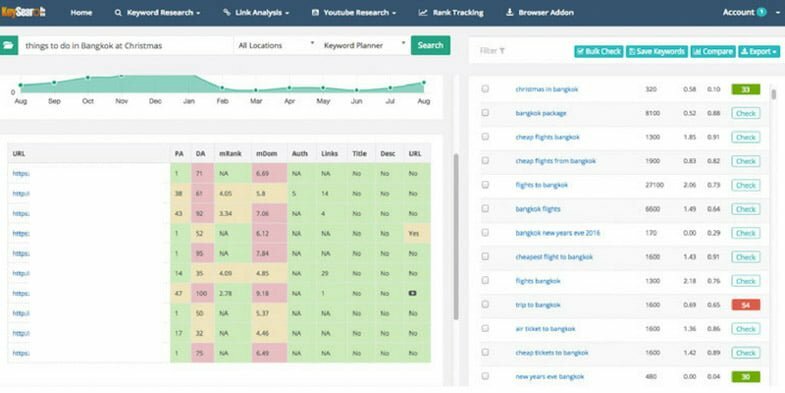 It’s only $17 per month or $169 for the year and well worth the investment because it tells you how many people actually search for the intended keywords (volume) and also how competitive it is. We have a 20% off coupon, just quote MTH20 at checkout. Honestly, the majority of bloggers and niche site owners in our Facebook group use Keysearch. Don’t worry if you are screaming what the flippin’ heck is she talking about? In the beginning, I did not know my plugins from my permalinks but my good friend, YouTube, had a video for everything – don’t be afraid to YouTube ‘how to’ if unsure. SEO is one of the main things bloggers do to get more followers to their site. In the future, this traffic will make you money through your affiliate sales. This is the stage I am currently at. Join our support group to meet link-minded bloggers like yourself and keep in touch via our newsletter. We send information, updates and a monthly newsletter to our subscribers. Sign up here. Initially, I thought guest posts meant asking your friends to write for you. I didn’t realise that the friend should have their own blog! Backlinks and exposure are some of the aims of guest posting. Reach out to other bloggers with a specific story that you can fill a gap in their niche with, but also meet your own needs – you want to expose that keyword we mentioned above and get your article hyperlinked back – this is called backlinking and can help with your Google ranking. It’s OK to be nervous the first time you contact another blogger! Be prepared for a knockback but move on and don’t fret. Alternatively, look out for call outs in Facebook groups for collaborative posts (‘best vegan restaurants in XYZ’… etc). Guest posting is a great way to get to know other bloggers and also get backlinks to your own blog (ask politely for a link to an article on a keyword instead of your homepage). It also gives your name some exposure and the chance to sell your charming writing skills! Rome wasn’t built in a day, as they say, and blogging is very much about developing skills as it is about sharing your life with your audience. Try to enjoy the experience, take pleasure in writing, read other (your niche and technical) blogs, and if you are stuck just ask the blogging communities that you’ve joined for help. Don’t sweat the small things! The next CMS update will break something else anyway. Any questions or further tips please comment below! This entry was posted in Blogging, SEO, Social Media and tagged Keysearch, SEO. Really interesting article, thank you. I think the time element on FB, Insta and Pinterest is always underestimated but can really be worth the time invested. oh and yes, Quality over Quantity. I’ve seen plenty of great blogs ruined by awful photos. It’s also something businesses don’t understand when we ask for advertisement payment – it takes a lot of investment (time, research, skills) to build our social media channels and maintain them! Thanks for reading and commenting. Great article. I’ve just started moving my blog from friends and family directed to a larger audience and your tips are excellent. One aspect I also need to work on is what the end goal is. Although I am diving into social media and trying to figure out the SEO stuff, I think what I currently most need to focus on is developing strong content that can speak to a wider audience. I’ll definitely be trying some of your tips though especially on joining FB groups. Nicola, that’s definitely the key to attracting more traffic. Sounds like you’re well on your way to accomplishing that. Loving 1 and 2 and 10 Gemma. I have written 477 guest posts on Blogging Tips alone. Toss in hundreds others and I have well over 1000 and adding guesties daily. SEO benefits through the roof as you note but the bonds you build through guest posting are the sweetest fruit of your service. Loving the tips and congrats to you and Laura for launching this awesome blog! Thanks Ryan. It’s great to have you as a reader! Glad you liked the post. Hey since i am totally new to blogging i came across this blog and i totally love it. I will be truly needing advices from blogging experts and i presume that would be no one other than you. Glad you found us, Tooba. We would love for you to stick around and learn as much about blogging from our community as possible. If you haven’t already, do join our active Facebook group, as well. Thank you so much, this is the first sight have found that didn’t try to offer me fifty courses before providing me actual helpful information. I will be following for sure as I think I can learn a lot and oh boy do I need help, lol. Thank you again. Excellent! We have heaps more at our free resources section and a full squad of people at all stages in our Facebook group – come join us! Making sure posting a high-quality content is important, but I also make sure to include hashtags on my post. I use Hashatory, a hashtag suggesting tool which helps you generate the right hashtags to help you reach out to people. Nice and helpful tips for getting followers on a blog, thanks a lot. Thanks for visiting. Come back for more resources whenever you need it! Hi. i just started my own blog and I’m quite shy about it. I am not a social media person, I hardly browse thru my FB, IG or Twitter and I have the most followers in LinkedIn which is only around 600. I feel like I am doomed already. How do I start? Daphne, I think we all feel that way when we just get started. It takes a while to warm up to being a more public figure on the Internet. You’re not doomed. You just have to focus on creating a strong community and an awesome blog, and don’t worry about the other stuff. It will come in time. I was looking for a code for a floating facebook page like button when I came across your article. Very helpful. I am yet to learn how to use Instagram but I am still concentrating on growing my Pinterest. That’s a great place to start – it’s my second biggest traffic driver after Google. Have you joined our Facebook group, Sharon? Great article! Thanks for picking a topic that no one wants to admit to but needs solutions to not choosing the easiest way for a change! Thanks for this article. It will be a significant help for bloggers to get more followers by understanding what has more chance of working to build their followers and their blog. Thanks again. Glad you found it helpful, Jessica. I’ve been blogging for about six years and this article was so way over my head I’d need a rocket launch to understand it. I don’t have a clue what you’re talking about. You have to be more basic in how to do these things for media morons like me. Sorry about that, John. There’s a lot to consider when blogging. It’s like being a jack of all trades. Thank you so much, this is the first sight have found that didn’t try to offer me fifty courses before providing me actual helpful information. I will be following for sure as I think I can learn a lot and oh boy do I need help, lol. What a great topic we have here. I really appreciate the effort on how you explain the topics in detail. I sometimes don’t get the idea of how Instagram addresses the feed in chronological order by recent posts. That kinda want me to unfollow the unnecessary people I followed. Anyway, Tons of Information I learned today! Few bloggers will only share this one. Thanks for sharing Gemma! IG is a ‘mare! Thanks for commenting. Wow. So much info in one place. Old brain, I guess. I have bookmarked this page so I can come back to it over and over. Thanks for sharing your expertise. I appreciate people like you who believe in abundance (sharing) over scarcity (hoarding). I will be working to incorporate many of your tips to growing my blog in the coming days, weeks, and months. Thanks Leanne. We believe in that too! If we all help each other, we’ll all be more successful. Do come back often, as we regularly add new content. Is it ok to guest post the same topic on multiple blogs (rewriting with unique content of course)? It can be limited finding an angle, especially for the travel niche if trying to rank for a particular destination guide. Definitely, you want to increase your authority on that topic and you are right to say unique content. Glad to hear it, Barakha. Nowadays Twitter has big roles to the blogging community especially in business areas, its an excellent plan for the promotion of the business. I have lately started to increase followers for my business and hope these suggestions will better me to get a huge result from Twitter marketing. Definitely agree with connecting with businesses on Twitter Dipak! Thanks for reading and the kind words. Thank you very much for a great article! To MY mind many ” IG celebs” use bots such as ingramer.com or bigbangram.com or others. They get their followers and likes, I think, in short period of time and then deny the fact they have used bots. IMHO. What do you think? Do you agree or pertially agree? I don’t personally know anyone that has used bots that admits it but in all honesty, most of the people in my circle are writers. Insta is more of a package than their main money maker. Definitely, f/u is the only way to get followers and engagement. I don’t understand why other bloggers get annoyed at business IGs for doing it though. Very Interesting article. But I dont understand why do people get followers from sites like adinflu etc in short time. Is it worth just to gain large followers since the followers would not be a niche. Whats the use of large followers with no engagements. You’re absolutely right, Sayeed. Having a large following without engagement is pretty useless. It takes time and effort to establish a real following. This was sooooo helpful. I launched my blog 2 months ago and I have been so overwhelmed. I have so much to learn but I’m so grateful for how well you laid everything out here. I bookmarked this page for use during this crazy journey. Glad you’re finding it helpful, Linda! Any thoughts on use of structured data? I’ve been wondering if it is worth learning more about or not. My early reading leads me to believe its more of a user experience bonus rather than an seo bonus. However, increased CTR should help with SEO. I think you’re right there, Mike. It’s good for useability, for sure. But I do think it will have an affect on SEO at least in small part, and it’s possible that Google will start using it more effectively in the future, so it’s good to have it set up. Very useful information. keep up the good work. Thumbs up for your time and efforts. such an amazing article. very helpful for me thanks for sharing with us. your post is very interesting to read.it’s very informative and helpful.Usually I never comment on blogs but your article is so convincing that I never stop myself to say something about it. You’re doing a great job ,Keep it up. Thank you for this article. I not only found the article super helpful, the comments were great as well. I am just starting the possibility of full-time blogging and I will say, some articles and blogs I have read about starting up have terrified me and make the end goal way too far fetched or unrealistic. I am happy to say this article and the comments filled me with inspiration that I can do this. Glad to hear it, Kali. You can definitely do it if you want it bad enough. It just takes hard work and dedication, plus know how. Excellent article! Will definitely use this for future reference! Great information thank you for sharing this wonderful post. Instagram has become one of the top most used social media platforms. This social media platform helps you to grow your business, but firstly you should know how effectively it works. Hi every one, m here 1st time, Such a amazing post. Its very simple if you provide quality to google, google will help you in terms of ranking and followers. And in this article, i think each and every steps you covered which help any blogger to get organic followers & to my experience this site help’s me a lot to increase my followers. That’s very true, Harsh. The ultimate goal is to provide quality to the readers. I need a like button! Amazing post – never even heard of SEO before now and so thought IFTTT was just for smart homes! Aw cheers Annie! Do get started with SEO, best move I ever made! wow, this is very interesting to read, I might need to come back when there are more updates, thank you for sharing this post. I am just starting my lifestyle blog and am SO GLAD I ran across this post! The irony is that I googled “How to get more followers on your blog” and this was the first article to pop up (HELLO SEO!). My question is, I really love Square Space to host my site but I’ve heard I need to use WordPress. Before I put too much effort into design- what is your advice? It’s okay to use Squarespace if that’s where you’re comfortable working. Many bloggers just feel that WordPress offers the most flexibility and options, which you’ll want to have when your blog starts growing.